Now that peony season has passed, I want to share some photos of this beautiful flower I took at my parents' home which is located in an idyllic suburb of northern NJ (really, really, NJ gets a bad reputation only from where IKEA and Newark International Airport are located - the rest of NJ is gorgeous especially in spring, summer, and fall!). I can't wait until next season. Peonies are my favorite bloom - they embrace you, they bloom with such unfettered bliss...the complexity of the petals, the volume of their folds. I want them in my home season round. A sagging U.S. economy is old news these days. I'm well accustomed to my London friends basking in the glory of the exchange rate during a NYC shopping visit. Can't say that I blame them; in fact, I admit, I am envious. Lucky for me, NYC boasts a plethora of consignment shops. They have always resided in shoppers' consciousness somewhere but now with a sagging economy, these boutiques are the place to go. Ina, Michael's, etc. are not only purveyors of shopping delight but also soothers of our economic conscience. Some of these shops only do business at their retail locations, but fear not, eBay is full of great secondhand boutiques. One of my favorites is Decades Two. 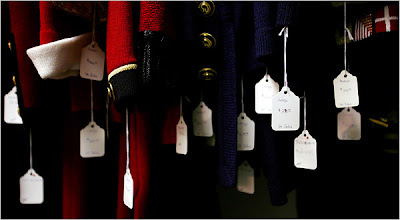 This boutique is based in LA but offers a beautiful assortment of designer labels (often vintage) through eBay. Louis Vuitton, Blumarine, Valentino, McQueen...the list goes on. You'll get the same high-end stuff but your bank account will thank you. I am a what I call a "clipper" or "clippings" person. Each month, I devote a solid block of time to getting through my periodicals. With almost 15 subscriptions, I am a junkie for information, for imagery, for names. Whenever I come across something interesting, I tear, I clip, I collect. I recently came across a site that does exactly this but in a much more streamlined fashion...i.e. digital. Fab Search is a fantastic clippings site focused on travel. Organized by destination, Fab Search collects clippings from a variety of online and print sources that recommend places to stay, places to eat. Each clipping has a short description, attributes the original source and date. I've been sifting through the recommendations for Nicaragua and Costa Rica. Check it out! I was quite excited to receive notice of the upcoming Alexander Wang sample sale in my inbox over the weekend. This wunderkind has proven his design chops through and through with designs that are at once feminine and boyish. He has expanded his mainstream presence through his Uniqlo collection but he never veers from his design philosophy. I can't wait for 6/25! Image courtesy of Alexander Wang, Inc. In my online meanderings today, two items have been added to my "I'm in love" list. 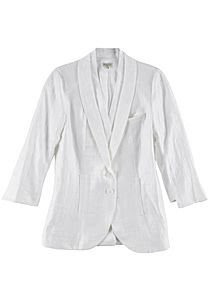 First up: a beautiful, delicate white linen blazer by Wayne whom I only recently discovered; despite the fact that the designer won the 2008 Ecco Domani Fashion Foundation award. Wayne's items are not sold in many places but thankfully, the editorial eye at La Garconne never fails. 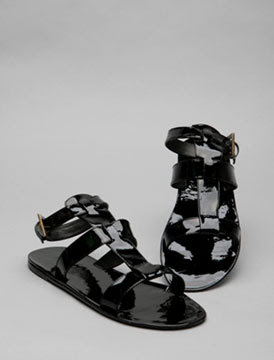 Paired with the blazer and a pair of shorts or slim jeans, I would love to buckle up a pair of Jenni Kayne's gladiator sandals. Tracie Egan, editor at Jezebel, recently published an incredibly smart, witty, and thoughtful article in Vice magazine expressing her view on fashion. You have to read it from start to finish yourself because I cannot wholly capture all of the thoughtful points she makes. What is it that drives us to desire "fashion" or "style"? And how do we *really* define it for ourselves? Egan helps us recognize that too often and too unfortunately our sense of fashion or style is driven by what others think, inflating our egos and self-consciousness which ultimately destroy true, objective taste...thank you Tracie. I am extremely excited to see this campaign. It further demonstrates China's re-entry onto the world stage. Increasingly, China's cultural side is being articulated to the broader world. It's about time. The news of Yves Saint Laurent's passing have been reported far and wide. 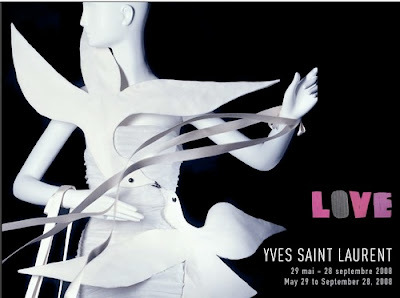 For those who want to honor his memory, Montreal's Musee Des Beaux Arts is holding an exhibition 5/29-9/28 to showcase 40 years of YSL's creations. May he rest in peace. The top two photos are from American Apparel. The following jumpsuit is being sold on eBay by seller "margherita_and_hannah". Gorgeous piece by Alexander McQueen for his MCQ label. I'm a little late with my post Memorial Day holiday posting but I wanted to share two beautiful photos for the record. Drove from NYC up to Vermont and had an incredible time drinking in nature along the way. End point: Lake Champlain --- I had no idea that a portion of Lake Champlain is situated in Vermont!! Surprisingly, the coast of the lake on the Vermont side is not very developed. Couple of small farm houses on big pieces of land but none of the fancy stuff you'd expect. There was a small road off the main one we were driving on called Adam's Ferry. Narrow and winding, we ended up in this little patch where you could literally have driven into the lake. It was so beautiful. The water was amazing and cool to the touch, the view unblocked. There was this beautiful tree located at the water's edge and its robust roots just reached so delicately into the water. Being close to a lake is definitely one of my top-tens for summer.